Bill Kelly is managing director, Wales and Borders Route. He spent 16 years in the Armed Forces after studying electronic communications, before moving to British Airways (BA). His 22-year career at BA included Head of Subsidiary Businesses for Wales, responsible for a team of 2000 and an annual budget in excess of £100m. He was Head of Heavy Maintenance, responsible for the overhaul and maintenance of the BA Fleet, a team of 2300 staff and budget of £260m, and Head of Operations for the BA operation at Heathrow with 4500 staff and a budget of £380m. 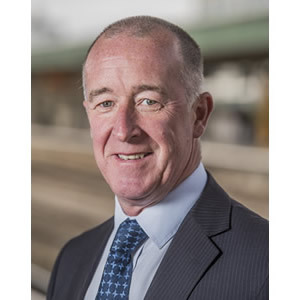 Bill joined Network Rail Wales and Borders as Chief Operating Officer in 2017 and took on the role of Route MD at the end of March after Andy Thomas was appointed MD for England and Wales.